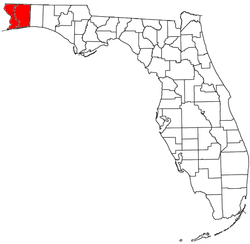 The Pensacola metropolitan area is the metropolitan area centered on Pensacola, Florida. It is also known as the Pensacola-Ferry Pass-Brent Metropolitan Statistical Area, a metropolitan statistical area (MSA) used for statistical purposes by the United States Census Bureau and other agencies. The Pensacola Standard Metropolitan Statistical Area was first defined after the 1960 United States Census, with Pensacola as the principal city, and included Escambia and Santa Rosa counties. Ferry Pass and Brent, which are unincorporated census-designated places in Escambia County, were added as principal cities after the 2000 Census. The population of the MSA in the 2010 census was 448,991. The estimated population of the MSA was 487,784 in 2017. The four incorporated cities within the MSA are Pensacola (Population: 51,923), Milton (8,866), Gulf Breeze (6,466), Century (1,786), and Jay (590). In addition, several unincorporated census-designated places account for a great number of the population. Most notable is Navarre (Population: 42,200); its population makes it the second largest community in the metro area, only behind Pensacola. As of the census of 2010, there were 448,991 people residing within the MSA. The racial makeup of the MSA was 75.3% White, 17.0% African American, 0.9% Native American, 2.4% Asian, 0.1% Pacific Islander, 1.2% from other races, and 3.1% from two or more races. Hispanic or Latino of any race were 4.6% of the population. Tourism in the Pensacola Bay area brings in about $552 million annually. Palafox Place contains multiple venues for nightlife.